In these days XML documents are everywhere. They are mainly used to exchange information between applications; however, they are also used for many other purposes. 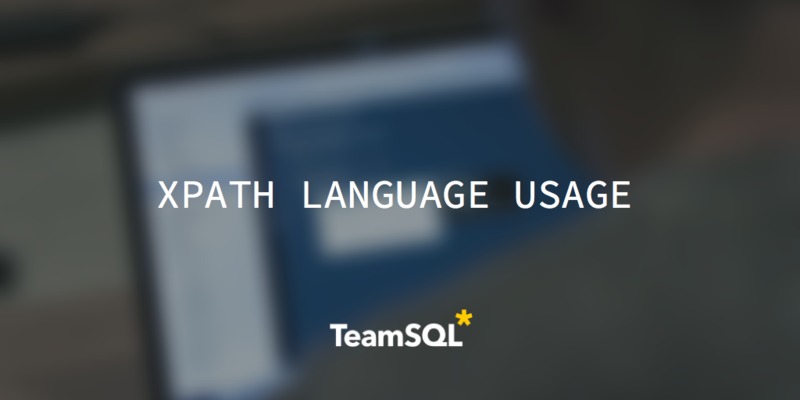 Moreover, almost all database engines supported by TeamSQL include XML as a data type. 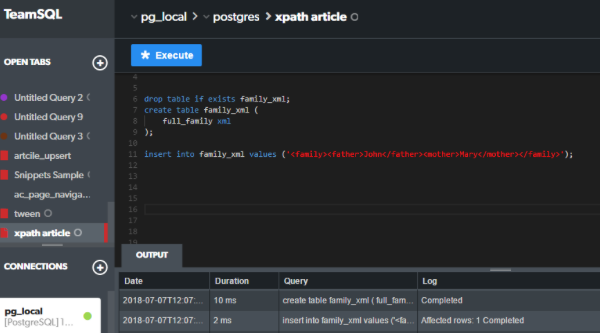 In this article we use TeamSQL to store XML documents on a database table, then we extract elements from the XML by using XPath expressions, and finally, we execute queries inside the XML document. First of all, to clarify we changed the format of the XML document in the insert. We separate each tag in a different line and use tabs to indent the elements. In XML it is possible to have attributes to describe an element. Let’s suppose we want to add the age to every family member element. We can insert the following XML document to include the age as an attribute. 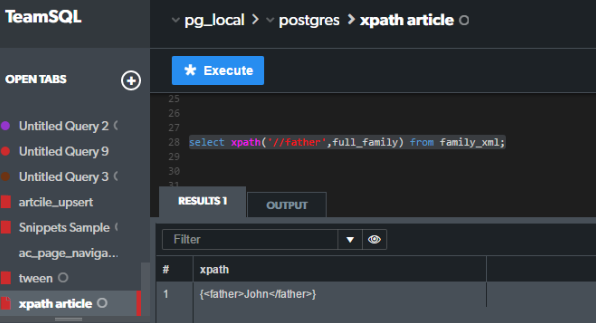 We can query the attribute value by using the following XPath expression. Note the ‘@’ before the attribute name. Finally, if we want to extract only one element based on the value of some of its attributes, we can add a condition enclosed in square brackets . In the following image, we can see an example where we extract the child element with age value = “13”. 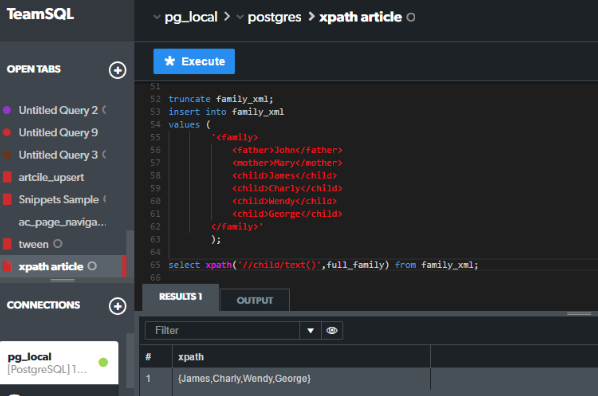 Using XPath() obtain a list with the names of all mothers. 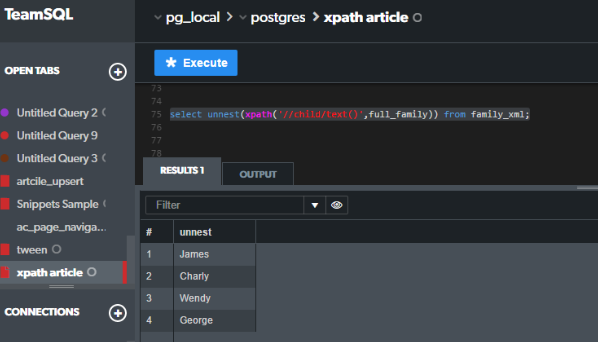 Using XPath() obtain a list with all families with all its members in XML format. 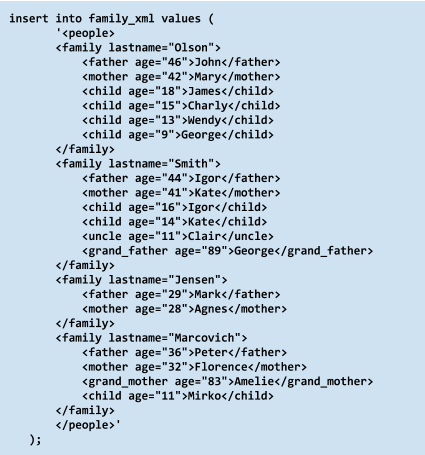 Using XPath() obtain a list with the names of all the members of family Jensen. Xpath() is a flexible function, to manipulate XML documents. In this article we did several operations on an XML document stored in a table using TeamSQL like the insertion of an XML, extract of elements from an XML and query some elements based on a condition. 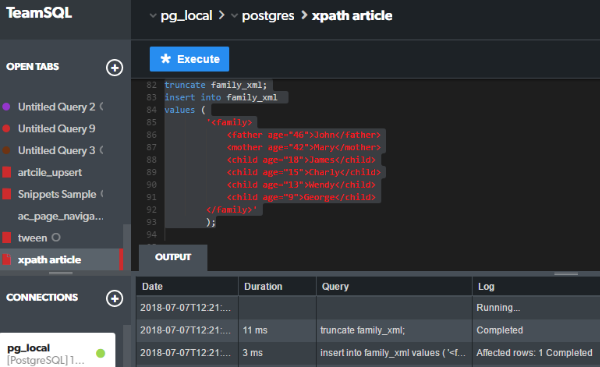 In a next article, we continue working with the next step in XML processing: The XQuery language, we do operations with XQuery over XML using TeamSQL. Let’s do it together!